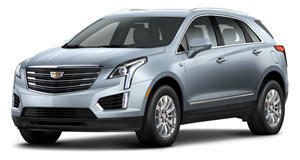 For the first time since it was at a photoshoot in New York, Cadillac has taken the wraps off of its all-new XT5 crossover that will replace the current SRX. Choosing to make the reveal at a New York fashion event called Public School New York, Cadillac says the XT5 is "distinctively styled" as it aims to take on competition from European and Japanese luxury automakers. The car's official debut, it has been announced, will actually be made at the Dubai Motor Show in November, when full details will be specified. In true fashionista style, once the car was shown at the event, it was airlifted out of there hanging from a helicopter and flown over the Hudson River. The presentation was enough to make an impression on some of the show attendees. But is the crossover's design really enough to make it a runway model? Check out the new pictures posted by the company, in addition to those snapped by showgoers and the one from Oppositelock that we showed you a couple of months ago, and decide for youself. Cadillac is quickly regaining its luxury brand reputation in terms of quality and refinement, which the 2012 SRX proves so well.